This is a collage of the dry plate photographer that was at the Steampunk event over the weekend .. He had his camera set up and groups of the Steampunkers came and posed for their photo.. Once set up they had to stand still for 7 seconds.. You can see the photographer timing in the lower left shot .. he then developed the plates on site .. the shot of the plate developing is not the one taken but another group there on the day ..
That is totally fascinating Julz, I could've watched this for ages. Great collage to show it all happening. What a fab collage - and love the setting! I do love the steampunk outfits too - I keep meaning to go to a convention when they have them in the UK, but always miss them. @lyndamcg well worth hunting an event out.. they really play up to the camera.. So interesting to see how photos were produced back then. So much easier with digital isn't it. A lovely collage with great shots. This festival has to be a photographer’s dream. Are the costumed participants a traveling troupe or are they local citizens? Their costumes and accessories are amazing. What a fun event to see. I love the reality of the photographer. Everyone really goes all out for this festival. Wow - just fascinating! Love how you set up your collage to tell the story. @louannwarren @henrir They are just a group of people that love to dress up in the weekends.. this day was organized by the Auckland Photographic society.. and the local vintage railway was 'hired' .. so we knew when the train was coming In ..
@onewing a little bit too easy perhaps I had over 800 images to go through..
Super collage of fun filled images! This must have been fascinating to see Julz, you would enjoy it. How times have moved on! I saw an amazing mobile phone taking photos last night at the concert. I asked her which one it was, a Samsung 9plus, very expensive but I was impressed! Someone else asked her what make it was too so I wasn't the only one! 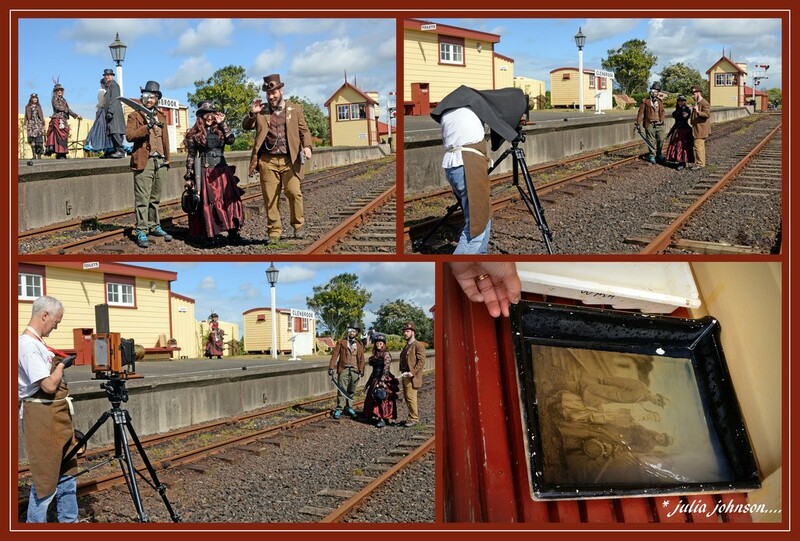 @happypat Yes I have heard it's got a great camera on it .. may have to upgrade mine..
Those steam punkers really love dressing up and getting their photographs taken!